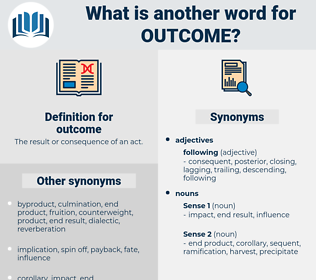 What is another word for outcome? The result or consequence of an act. successful, result-oriented, fruitful, productive, final, conclusions. procedures, Judgments, benefits, instruments, submissions, mandates, practices, data, approaches, paragraphs, findings, final. situations, endpoints, Fruits, choices, Tallies, citations, returns, Gains, Judgments, findings. Sequelae, data, fruit, endgame, end-result, exit, finalization, by-product, difference, fate, breakthrough, final, avail, prognosis, outlet. 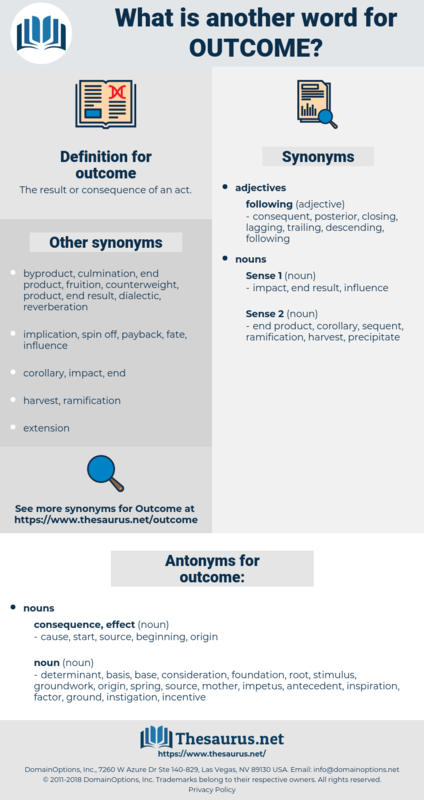 Came, concluded, reported, implemented, ended, reflected, Caused, Indicated, stemmed, Happened, represented, Were, Suffered, led, Performed, Worked, received, turned, proved, Arose, Gained, Appeared, spoke, Went, said, added, found, showed, Got. concluded, conducted, ended, commissioned, Happened, led, turned, found. evaluates, occurs, ends, reflects, stems, originates, happens, follows, leads, turns, arises, hits, goes, looks, Leaves, findings. culmination, adjournment, out-turn, outgrowth, solution, verdict, implication, corollary, finalisation, conclusion, fallout. cause, start, source, beginning, origin. determinant, base, inspiration, consideration, mother, foundation, impetus, factor, incentive, instigation, basis, antecedent, ground, root, spring, stimulus, groundwork. Anybody who doubts the outcome is a fool. There were splendid sources of strength in this man, the outcome of such a race, from which his children could draw.